Cardboard Kingdom (Knopf, 2018) bounced to the top of the book-review radar the moment it was released, and soon after tallied an impressive 5 starred reviews. It’s a book for the times: a graphic novel with vivid colors and diverse characters created by author Chad Sell’s graphic-artist friends. Every race and ethnicity is represented in the various skin colors of the characters. Where the diversity may go a little too far is in the “identities” these kids are probably too young to grapple with. Janie: I’ll start with a plot summary, since we haven’t reviewed this book. It’s summertime, and the neighborhood kids are not hunkering down under the AC but exercising their imaginations in the backyard with cardboard boxes and crepe paper. Jack, for instance, see himself as a sorceress (not a sorcerer), and his neighbor is willing to help him as long as she can be a knight (not a princess). Meanwhile, loudmouth Sophie, to her grandma’s distress, loves herself as a bully-besting Big Banshee, while Miguel and and Nate are developing feelings for each other as the handsome Prince and Dashing Rogue. Becky and Alice go into to business together. Seth (a.k.a. Gargoyle) has a violent dad. A girl called The Robot appears to be an alternate human. Roy, or the Bully, lives with his grandma because his mom is in some kind of rehab . . . and a few kids live in hetero, two-parent families! Over the summer they mold their identities and have fabulous adventures, and when it’s time to back to school they are all firm friends. I like the book’s emphasis on imagination and creativity, and hardly a screen is seen in its pages (except an old-fashioned movie screen at the neighbor cinema). The kids have their scrapes and disagreements but manage to work things out on their own. Obviously we have our problems with it, but before we get to that, what else do you see as selling points, Betsy? Betsy: I love the imagination present in this book, Janie, and I thought the format really lent itself well to portraying a story of kids dressing up and instantly becoming their imagined identities. Putting on a costume often equals stepping into a new role for kids, and a graphic novel can show that in ways mere prose can’t. I also like that so many different kinds of kids and families are represented. On any given neighborhood street, there are single parents, married parents, kids living with grandparents, sibling issues, neighbor squabbles, and the like. The kids in this story grapple with their various challenges, and they really do learn to compromise and appreciate what each person brings to the table. That being said, the sheer variety of “diversity” smacks strongly of agenda: instead of the theme centering on imagination, it becomes a trumpet call to appreciate all forms of diversity, whether or not each form of “diversity” is equable or desirable. It would have been nice to see some nuance. Plenty of kids “try on” different identities, even questioning their gender and sexuality, without that becoming their defining identity. It began to feel like an agenda instead of a celebration of the many sorts of people around us. What did you think about that? Janie: I got that impression, too. As I mentioned earlier, these kids are young: between ages 7 and 11. What they know of “identity” is what they hear and see around them. That’s not to say that some children don’t experience real gender confusion, possibly even from an early age, but I believe it’s rare. In this neighborhood, it seems that every kid wants to bend gender stereotypes in some way. Most of the parents are sympathetic—to a fault, sometimes. When Jack, the “sorceress,” admits he’s drawn to that role in order to be magical and powerful and amazing, his mom sighs, “Oh, sweetheart—you are!” Sounds like magical self-esteem boosting. Jack also wants to lead an “Army of Evil”–Why evil? There’s a lot of yelling and ambushing and counter-attacking: the Kingdom operates on power and intimidation. This is what we now call “toxic masculinity,” but it’s okay when girls, or boys pretending to be girls, act out that scenario. Since girls and boys actually do play more combative roles when they’re all running around on the playground, I’m not bothered by the aggression and intimidation. But coupled with the agenda angle, the book seems to be telling kids that they’re magical and powerful and amazing and whatever identity they choose is going to work out just great and they’ll be able to get along with everybody if they just be themselves. Is that the message you get, Betsy? Betsy: Janie, that is a fantastic point about “toxic masculinity” being acceptable if a person identifying as female practices it. I think you’re right about the central message of the book: “Be all you WANT to be” and all will be well. Rather than reassuring, I think it is deceptive to kids. If they buy into that message, particularly if it’s before middle school, there will be some rocky times ahead. A better message would be: embrace the unique person God created you to be with its strengths and weaknesses. None of us can be all we want to be—or be all we should be—without Christ. And when we fail, or are confused, or have doubts—we look to Christ, not ourselves. Parents who affirm their kids in everything miss a golden discipleship opportunity. We don’t want books to be preachy, but I can’t help wondering about how the message of the book would have come across had the parents been a bit more, well, adult. For instance, when Jack says he wants to be powerful and amazing and magical, the mom could have said he was amazing just the way God made him. And then asked him how he thought he could be powerful and magical. Is a sorceress the only option? What did he not like about sorcerers? If he thinks sorcerers are too domineering, then that’s a GREAT opening to talk about how not to use power, not how to eschew male heroes all together. Obviously, there’s a lot going on in this book. I think it offers an opportunity to discuss these topics with our kids because it illustrates so much of the messages they’re are getting from society. And it’s good to start talking about the many diverse men and diverse women God did create: men can be both godly AND artistic, gentle, thoughtful, and even need to be rescued; they can also be strong, decisive protectors. Women can be entrepreneurs, strong, decisive, artistic, gentle, resourceful (look at the Proverbs 31 woman!). But that doesn’t change the fundamental nature of creation and God’s particular creation of male and female. This is obviously a topic that can’t be addressed in a post like this, but it certainly highlights how much we need to bring everything we read under the lens of Scripture, and how much we, as parents and teachers who seek to honor the Lord, seek to disciple our children in understanding the messages around them, especially when they conflict with Scripture. It’s a very well done book, artistically; it could have been a great book. Janie: That’s a valuable point that speaks to one of our main goals at Redeemed Reader: not just to tell parents what’s good and bad, but to help them use children’s literature to develop a biblical worldview. Kids learn from negative messages as well as positive ones, so long as they are taught to evaluate them in the light of God’s word. Next, we’ll talk about the many positive messages in The Girl Who Drew Butterflies! Thank you so much for having that goal! Appreciate the reviews, especially on the Newberry’s since those are the ones librarians are pushing. Hello! I think you bring up a lot of interesting points here—although I have a question about the point you make about diversity. What kind of diversity can realistically be considered undesirable? Landon–I’m sorry for the delay in answering your original question. We don’t consider the current fascination with transgendering (to make a verb out of an adjective) to be desirable at all. 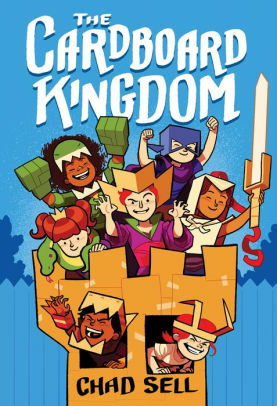 It’s fairly subtle in Cardboard Kingdom, but ALL the girls are deliberately un-girly (loud, aggressive, or money-obsessed) and most of the boys seem confused about their gender identity, sexual attraction, or parental involvement. As we said in our discussion, it seems very agenda-driven, and that’s our problem with it. Thanks for your response! I agree that there is agenda present but that it’s focused on equal representation of all types of readers, rather than just focusing on, and targeting, heteronormative children. Luckily there are enough books out there that already cater to that.